tastic proximity to charming Carmel-by-the-Sea for shopping, dining and entertainment, are also part of the excellent Carmel Unified School District. The area is bordered by Santa Lucia Street to the north, Carmelo Street to the south, Scenic Road along the coast to the west and on the eastern side by Rio Road near the historic Mission Carmel. Homes are within walking distance to Carmel River Beach, Carmel Beach, and the historic Carmel Mission Ranch, with dramatic whitewater views of Carmel Bay and Point Lobos. Homes are generous in terms of square footage and are often on large lots. Whether your tastes lead you to sophisticated modern, classic traditionalism, or Tudor design, Carmel Point real estate will not disappoint with its individualistic styles and charms. Click here to preview all Carmel homes for sale in the Carmel Point neighborhood. For all available Carmel real estate, click here. Homes in this neighborhood are highly sought after. 28 homes sold in this neighborhood in 2018. 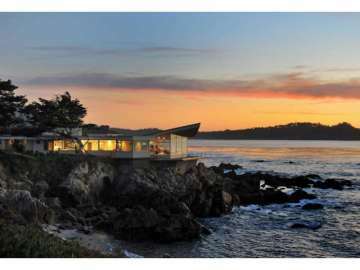 The most expensive home sold for 7.5 million and was located on the coveted Scenic Drive in Carmel, across the street from the Ocean. This home featured 3 bedrooms, 3 bathrooms, 2,601 SqFt of living space on two lots that equal 11,292 SqFt. The least expensive home sold for 1.2 million and was a 2 bedroom, 2 bathroom Carmel cottage fixer with 1,133 SqFt of living space on a 6,000 SqFt lot. 27 homes sold in this neighborhood in 2017.The most expensive home that sold was an Oceanfront, 3 bedroom, 3.5 bathroom home with 4,087 SqFt of living space on a 9,400 SqFt lot and sold for 9 million. The least expensive home sold for 1.050 million and featured 3 bedrooms, 2 bathrooms, 1,550 SqFt of living space on a 8,700 SqFt lot. In 2016, 19 homes sold in this neighborhood. The most expensive home to sell sold for 11.5 million. This beautifully designed home sat on a 9,800 SqFt corner lot with 6 bedrooms, 6 full and 1 half bathroom with views from Point Lobos to the Pebble Beach Lodge and everything in between! The least expensive home to sell in this neighborhood was a 3 bedroom, 2 bathroom home with 1,815 SqFt of living space on a 5,998 SqFt lot with close proximity to River School; sold for 1.35 million. 14 homes sold in this neighborhood in 2015. The most expensive home sold for 6.9 million and featured 3 contiguous parcels that back up to Scenic Rd across from the Carmel Bay and is complete with shovel-ready, approved plans for a 6,237 SqFt home. The least expensive home that sold was a 2 bedroom, 2 bathroom, 1,073 SqFt home on a 10,500 SqFt lot with views of the Carmel Mission and selling for 971K. 26 homes sold in this neighborhood in 2014. The most expensive home sold for 6.8 million; this remodeled 3 bedroom, 3 bathroom residence features 2,644 SqFt of living space on a 5,700 SqFt lot and is located just across the street from Carmel River Beach with views of Point Lobos. The least expensive home sold for 940K and was a 1,616 SqFt home on 7,000 SqFt of land. 23 homes sold in this neighborhood in 2013. The most expensive home sold was a 2,356 SqFt home on 4,600 SqFt of land, which sold for 4.975 million. The least expensive home sold in 2013 in the area was a 743 SqFt home on 5,000 SqFt of land, which sold for $1.295 million. In 2012, 19 homes sold in this neighborhood. The most expensive home sold for 5.175 million and was a 3,186 SqFt, 4 bedroom, 3 bathroom home on a 7,971 SqFt lot. This lovely Tudor estate had spectacular views of Point Lobos and Carmel Bay. The least expensive home sold for 420,334 and was a 632 SqFt 1 bedroom, 1 bathroom Craftsman cottage on a 6,000 SqFt lot. 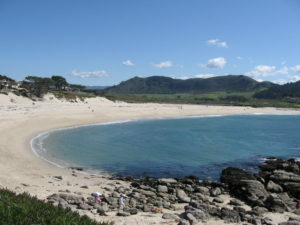 perhaps bringing your dog along for the adventure, and walk to some of the most beautiful spots in Carmel. Carmel Bay sparkles brilliantly in the morning sun while in the distance the rugged coastline of Point Lobos appears in stoic splendor. How can one not feel in touch with nature with the fresh sea breezes and sand underfoot. As an owner of a Point Carmel home you are also in walking distance to world class dining and shopping in neighboring Carmel-by-the-Sea. You can also take advantage of all of the events in the Carmel Area-from the sensory delights of the Carmel Food and Wine Festival to the much anticipated Bach Festival each July your calendar will be filled to the brim. A home in Carmel Point gives you the ultimate in convenience, access, and unrivaled beauty from the peacefully calm perch of your home by the sea.